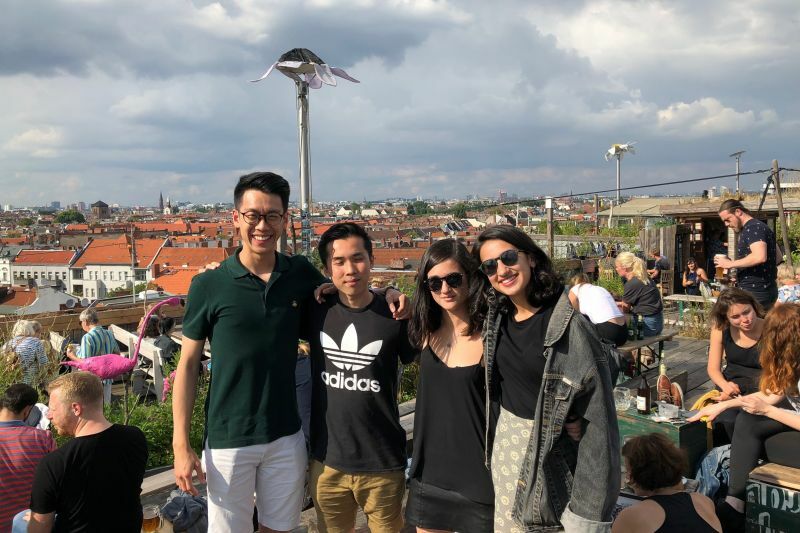 Bachelor of Commerce student Sarah Tarrant Kuang was part of the Global Management Consulting (GMC) cohort that travelled to Berlin in July. Her student team completed a consulting project at Berlin Partner. Together with three other highly talented students, I had the amazing opportunity to consult for Berlin Partner, a business support organisation that works to promote Berlin as a global hub for business and innovation. I chose to apply for the Berlin placement as I had visited Berlin before and was keen to come back and see more of the city. The arts and music scene in Berlin is fantastic, and it’s a very easy city to get around on foot or bike. - Sarah and her team in Berlin. I also love how easy it is to get out of the city – there are a lot of lakes you can visit within an hour of the city, which are always busy with people swimming. In terms of work-culture, we had been briefed on German business customs, but I was still unsure what to expect. However, soon after arriving in our client’s office, any worries I had were gone. We were welcomed into the workplace, and our presence and input felt valued. Aside from a few small cultural differences, overall the work culture was not dissimilar from my experiences in Australia. My team’s initial project brief was broad, which was both exciting and daunting. What first looked like a straightforward marketing project quickly morphed into something else. Our client was concerned that the fast-changing housing market in Berlin was harming Berlin’s reputation as a global hub for international skilled workers. We had to examine the nature and impact of the issue, analyse the role of businesses in tackling the problem and explore how Berlin Partner could support positive change. Our team was given freedom to develop an approach independently, so we had both control and ownership over the project. Our project required a wide range of knowledge and the diversity in my team allowed everybody to contribute their own unique skillsets. I learnt so much from my fellow teammates and have walked away from the GMC with greatly improved presentation and slide-making skills. I hadn’t expected my economics and management majors to be particularly relevant and enjoyed applying knowledge from my university studies. A major challenge we faced was a lack of existing data, which meant we had to improvise. We conducted more primary and secondary research than I had thought possible in the two-week timeframe, and from this were able to draw valuable insights for our client. Delivering our final presentation to the client was an amazing feeling as we could see the results of all our hard work. This experience has further solidified my interest in management consulting and has been a highlight of my degree so far. For students looking for hands-on experience in management consulting and cross-cultural work, the GMC provides an invaluable experience. Are you interested in hosting a student team? Are you a Bachelor of Commerce student and wanting to do that next Global Management Consulting?